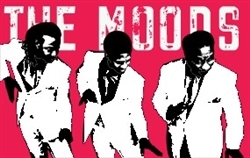 THE MOODS have been entertaining crowds at clubs, festivals, weddings, corporate parties and major fundraisers all around the Chicagoland area and across the country. They have performed with and opened for such major talents as The Temptations, The Spinners, Mary Wells, Bernie Mac, Chuck Berry, Little Richard, The Stylistics, The Impressions, The Chi-Lites, and the list goes on and on. We would love to work with you to personalize your special event and make it a "Vocal Experience Never Forgotten."